Nintendo's Wii™ console brings a revolution of motion controlled gaming to people of all ages and families everywhere. Discover exciting titles like Wii Sports™, Wii Fit™ Plus, and New Super Mario Bros.™ Wii—available only for Wii. Enjoy new entries in legendary franchises like Mario™, The Legend of Zelda™, Metroid™, and more. Connect online to download new and classic games, stream TV episodes and movies via Netflix, or surf the Internet from your living room. Get off the couch and experience a great value in video games—available now in black or white and includes with Wii Sports, Wii Sports Resort, and more! What comes with Wii ? The Wii Remote controller is easy to use. The familiarity of a TV remote, combined with motion-sensing technology makes for a seamless experience. Just pick it up and make the motions you would as if you were really bowling, playing tennis, or golfing. Discover a vast library featuring hundreds of games for the Wii console. From sports, to action, fitness, and more—you'll find something for everyone to enjoy, no matter what type of gamer you are. Personalize your Wii experience with Mii™ characters and the Mii Channel, then download cleverly designed Mii characters made by other Wii owners from the Check Mii Out Channel. You can create your look-alike or an entirely different character. It's up to you, so get creative and have fun with your Mii characters! All Wii consoles can connect to the Internet with a broadband Internet connection. Once connected you can download hundreds of new & classic games directly onto your Wii console, play select games online with friends near and far, surf the Internet from your couch, and so much more. You'll discover an online world that's worth coming back to again and again. Connect the Wii MotionPlus accessory to your Wii Remote controller to increase accuracy and enhance play control on compatible games. Look on the back of Wii Game Disc packaging to see which games are specially designed for use with Wii MotionPlus. 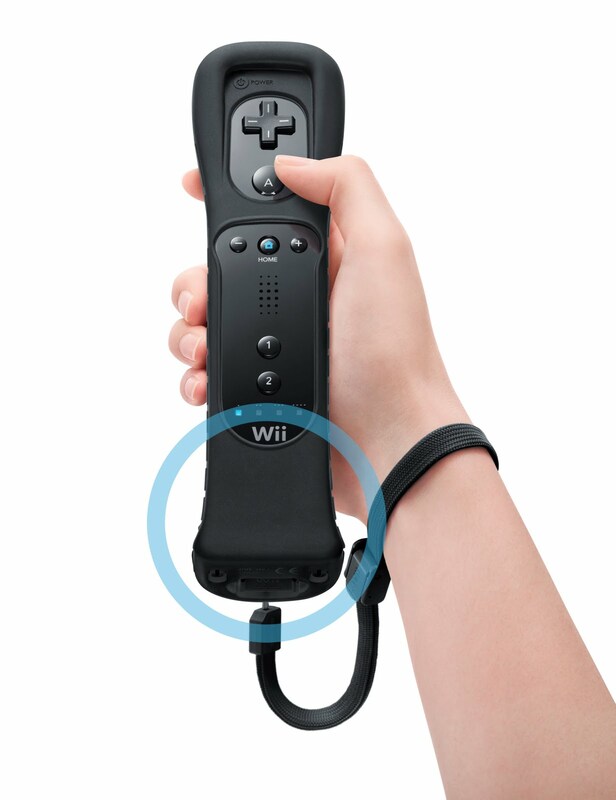 Wii MotionPlus contains additional sensors that make the Wii Remote respond to the slightest movement, motion, or twist of the wrist. Wii MotionPlus must be used with a Wii Remote. When I was younger I loved to play Super Mario Brothers with my brother's on the original Nintendo game console ( the theme song is still fresh in my mind;). Those (at times competitive) fun hours spent with my sibling's aren't something that I would trade for anything. How excited was I to have the opportunity to review the new black Wii by Nintendo?! In our home now, my husband is the gamer (he loves sports games of all sorts,) while I am more of the active type (I am rarely stationery)..and my kiddo's definitely take after me in this way. The Wii by Nintendo is right up our alley, as you can actually actively play. The game begins and ends with your movement. A sensor bar (that you place either on the top of the television or on the television stand) captures your movement and implements it in the game. 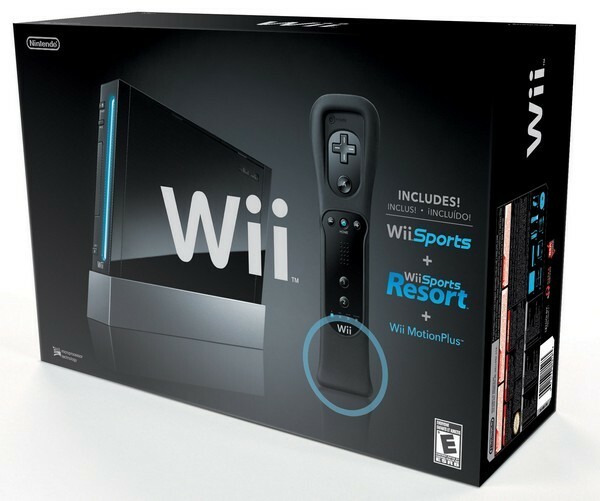 With a variety of sports games ( Wii Sports and Wii Sports Resort) included in the new basic package we were excited to try out the new sleek black Wii right away! Setup was simple (took about 10 minutes); we popped in the game and B was playing his favorite outdoor game in the comfort of our family room at 8 at night. He always laments having to go indoors after the sun goes down ( he would play outside morning noon and night if I allowed it)- and now his fun doesn't have to stop! He loves the baseball, tennis, and bowling, ( and so does mommy :) The princess has been enjoying "Disney Princess: Enchanted Journey" for Wii; a game that we picked up separately for her so she could join in on the Wii family fun too! I have to say, we have used it almost every day since it arrived, and with it's sleek piano black finish, it blends right in with our other electronics. The Wii has brought endless hours of family entertainment, getting us up and moving for family game nights that have created and will continue to create cherished family memories. What I appreciate most as mom is that Nintendo has made this active family gaming console affordable and attainable. At a time when most companies are skimping on extras while inflating pricing ( on both games and consoles); Nintendo has done the opposite with the Wii by adding more incredible value with games and extras to this gaming system that is truly like no other. Wiiiiiiiiiiiiiiiiiiii! The Wii really does offer fun for the entire family! Now I'm off to find myself a copy of Super Mario Brother's.....to relive some old memories...... and create some new one's with the kiddo's; after all, isn't that what family is all about?! BUY IT: Ready for some family fun of your own? Find the New Wii Basic Package ( In Black or White Color Options) at a Retailer Near You! Aww, sounds like you guys are enjoying it, Its nice because we can play a lot of the games with the girls. They love it. My girls particularly love just dance. It is fun for the entire family, be ready with a video camera.Hope you are all doing well. We still haven't gotten one, but would one, Maybe it would be a good way exercise from a chair or with little standing. I know you can use the Wii to stream movies from your computer to your TV. Love to have one, thanks for the review. Sounds like you had a fantastic time. We love the WII around here - just wish I could add MORE educational to the physical element then it would be perfect. My friends have one and we checked The workout game that you use with the balance board. We picked out avatars, played some games slalom-ed down slopes, tested our center of gravity, and whacked a bunch of flying things coming at us using only our heads). It was hilarious! We laughed so hard! I'm thinking of buying for myself so I can practice and surprise them the next time we get together! The Wii is awesome. Now pouncing on great deals for Wii games at Amazon. We love our Wii here as well. My children and husband do enjoy it. I too, would like more educational games to throw in the mix for them. The Wii makes for a great winter activity when it's too cold for the kids to go outside. We have below 0 temps here in Wisconsin and lots of cold wind chills.